fortunately they delivered it in the middle of the afternoon, when most of the neighbours weren't home. got gravity? 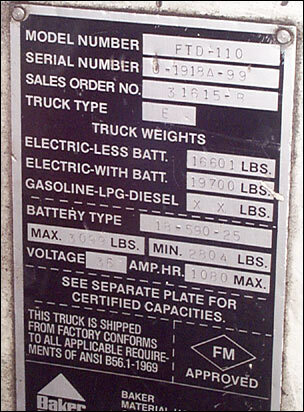 good, because the forklift came without a battery ("batteries not included. some assembly required"). 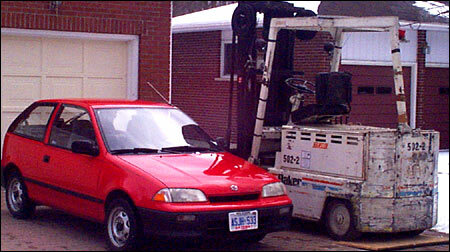 note the technician "driving" the forklift off the truck bed. 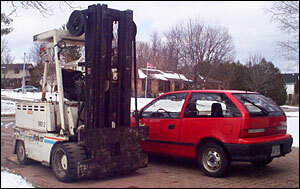 the vehicle on the left is nearly 10 times the weight of the vehicle on the right. delivery was $125. we haven't decided if we'll have to have the trucking co. come back for the chassis to take it to the recycler, or whether we'll tow it ourselves (a friend has a 4wd hemi ram). the recycler is about 3 km from the house (2 mi.) we'll get about $200 for the scrap metal. Hey keep the lift and use it to raise cars to work under them!! Easy way to do a belly pan! you know, looking at that thing has me thinking similar thoughts. except more like: man, how flimsy our little cars are! definitely easy to do a belly pan with this. i wish we could somehow use it to lift *itself* up so get at the motors. they have to come out from underneath. 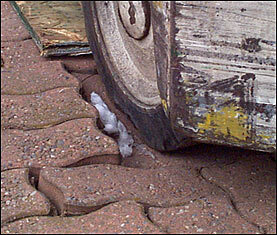 the technician says that's how they take them out at work - use another truck to lift up the back end and then block it. my buddy is tracking down some heavy duty jacks tomorrow. i'm going to start tracing wires to figure out how it's put together.